With 415 votes for and 119 votes against, the U.K parliament has given the go-ahead for the construction of a third runway at the city’s busiest airport, Heathrow. However, this is just one more step in many phases that will have to be gone through before any construction work. The vote gives the green light to the construction of a new runway at the airport, but that is all. There is still a long way to go before it will be agreed what, exactly, can be built, and what increase in flight numbers will be permitted. There is still sufficiently strong opposition to the runway, not just from key British ministers such as Foreign Secretary, Boris Johnson, who was conspicuous through his absence from the vote, and the Mayor of London, Sadiq Khan, who immediately took to Twitter afterwards: “I will join the legal action brought by local authorities in opposition to Heathrow expansion. There is considerable and understandable opposition to the new runway from residents in the location, many of whose homes have now been blighted. The airport will continue to increase passenger numbers for now, but only through carriers using larger planes for the existing number of slots. The third runway has the potential to increase the current 480,000 takeoffs and landings each year to around 740,000 – an increase of 54 per cent. In terms of passenger numbers, the third runway could increase capacity to 130 million, a near 70 percent rise compared to the 78 million who passed through the airport in 2017. MEKCO Group has entered into a strategic partnership with Donica, as their dealer and authorized repair facility for In-Flight Entertainment & Connectivity (IFEC) equipment sales & repairs. West Star Aviation Announced the appointment of Howard Allred as Chief Financial Officer (CFO) of West Star Aviation. Allred has served in a senior financial leadership position for over 31 years, including that of CFO and Director of Finance for various companies including Adidas Taylor Made subsidiary, Nike and Specialized Bicycle. Howard will be located at West Star's East Alton, (ALN) facility and will be responsible for the financial welfare of the company. StandardAero has attained European Aviation Safety Agency (EASA) certification for their retrofittable crash-resistant fuel tank (CRFT) system for the Airbus Helicopters AS350 and EC130 family of light single helicopters. The newly approved CRFT was developed in partnership with Robertson Fuel Systems, the leader in the design and manufacture of fuel containment systems. StandardAero achieved Federal Aviation Administration (FAA) certification in early December 2017 and has since begun delivery of CRFT kits to its customers, including launch customers, Air Methods and WeatherTech Aviation. StandardAero and Robertson jointly recognized Air Methods in a celebratory event during HAI Heli-Expo, at the time commemorating the successful installation of 11 crash-resistant fuel tank retrofits, representing the first step in updating their entire fleet of affected aircraft. Since FAA certification, StandardAero has delivered 40 CRFT kits to its customers and has been actively engaged with several fleet operators interested in enhancing their fleet with this new technology. Iberia has taken delivery of its first A350-900 on June 26, at the Airbus factory in Toulouse. The A350-900, registered as EC-MXV, and named for Plácido Domingo, is the first unit of its type boasting improved aerodynamic performance and structure, thanks to the use of a large proportion of composite material in its manufacture, along with a new design of some parts like the wings and window frames. The reinforced landing gear enables the airplane to take off with a maximum weight of up 280 tonnes. Two Rolls-Royce Trent XWB engines, each delivering 84,000 pounds of thrust, power the 348-seat aircraft. The first commercial flights of the “Plácido Domingo” will be made on routes from Madrid to London and to Paris starting on 20 July. From the 4 August the new aircraft will be used for Madrid-New York flights. The acquisition of the A350-900 is part of Iberia's fleet replacement and expansion programme which began in 2011. Since then, a total of 56 new aircraft have been ordered for the Spanish airline: eight A330-300s and 12 A330-200s have already entered service, and are to be joined by 16 A350-900s, and 20 A320Neos. Iberia has also renovated its 17 A340-600s, installing all-new cabin interiors, individual entertainment systems, and Wi-Fi connections. The delivery of the first A350-900 also marks the launch of a new concept of airline operations management called eOperations. It allows the storage of flight documentation digitally on an electronic support, and to integrate on-board systems with Operations and lT infrastructure. AeroMobile, a Panasonic Avionics Corporation subsidiary, and UAE telecommunications operator Etisalat have partnered to simplify and reduce the cost of mobile phone use inflight. AeroMobile’s inflight mobile phone service is now available in Etisalat’s mainstream roaming packages, allowing their subscribers to stay online, make and receive calls, listen to voicemail on AeroMobile equipped aircraft at no extra cost. AeroMobile inflight mobile services are available on more than 20 airlines worldwide including Emirates and Etihad in the UAE. Baines Simmons, part of the Consulting & Training division of global aviation services group Air Partner, has delivered Part 21 training in Shanghai to the Commercial Aircraft Corporation of China (COMAC), as it evaluates the European Aviation Safety Agency (EASA) regulatory framework. 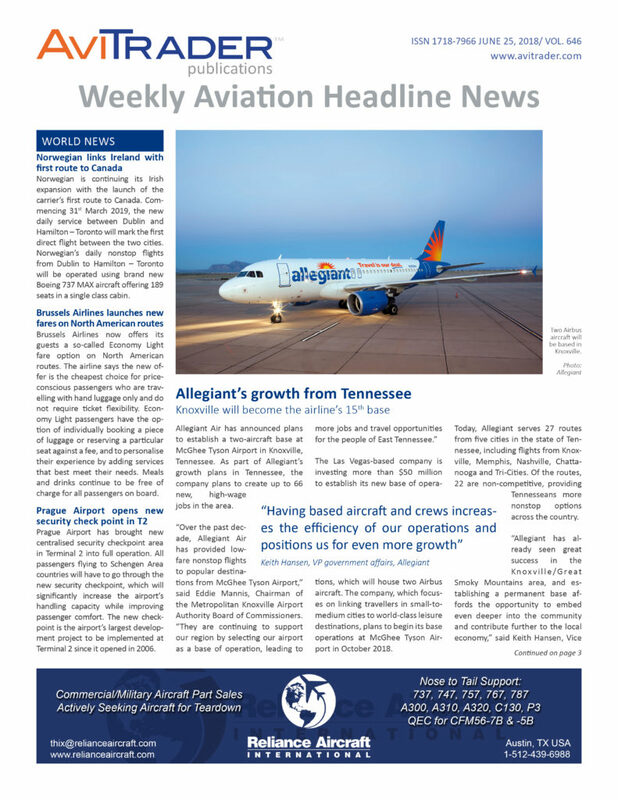 AJW Group has signed a component repair agreement between the US-based leisure carrier Allegiant Air (Allegiant) and the Group’s Montreal-based MRO facility, AJW Technique. 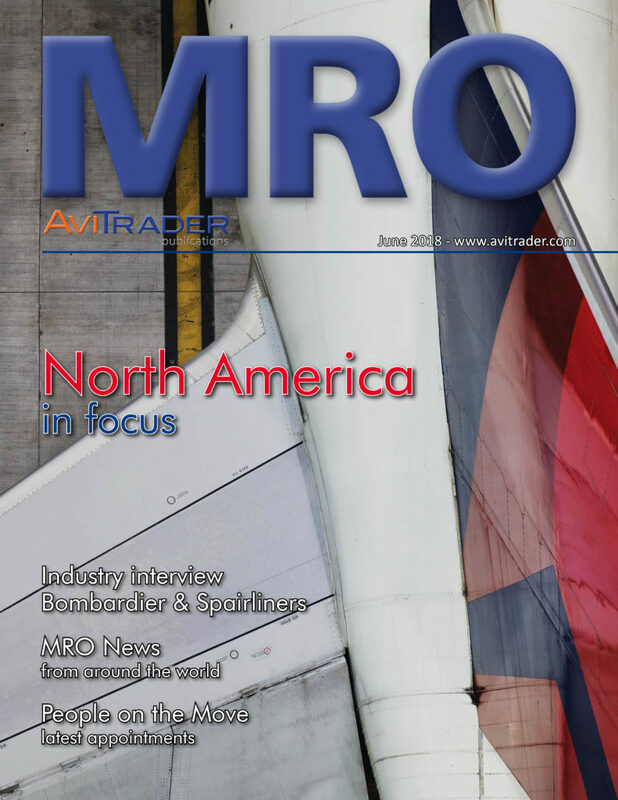 The contract, covering 150-part numbers, is a significant win for the aircraft parts maintenance and repair specialist, which signed the deal during the MRO Americas expo in Orlando, Florida. Allegiant has outlined ambitious growth plans that will see AJW supporting up to 100 aircraft by 2020 for the low cost, Las Vegas-headquartered carrier. The agreement is a fixed price repair contract that utilises quality focused engineering practices to increase the on-wing life of the components and thus improve dispatch reliability. The contract, which will be carried out at AJW’s 160,000 sq. ft. state-of-the-art facility near Montreal’s International Airport, will provide Allegiant with access to a full pool of A320 forward exchange spares material. Boeing and Bamboo Airways have signed a commitment for 20 787-9 Dreamliners in a deal that would be worth US$5.6 billion at current list prices, when finalized. The announcement was made during a signing ceremony at the U.S. Chamber of Commerce office. GA Telesis has announced Frederic Denise as its SVP Strategy and Corporate Development. Denise will collaborate with GA Telesis’s CEO, Division Presidents and Staff Executives on further developing the GA Telesis Ecosystem. In addition, Denise is responsible for the growth of global business strategy, partner and customer relationships, mergers and acquisitions, after market solutions for OEMS, and participating in customer engagement opportunities. Previously, as Vice President and General Manager with Zodiac Cabin OEM, Denise directed oversight and management of key locations which produce interiors for Airbus, Boeing and Bombardier.